Rhoom is a Los Angeles based designer and manufacturer that advocates simplicity and functionality. I guess that's why this piece is simply and functionally called "Desk #230." Anything else you need to know, you can find on the Web site. Well, almost. The #230 manages to be bold and minimalist at the same time. Bold because the designer chose to balance a built-in flower vase on the right with a small top-mounted cabinet on the left. (And mounted flush with the front of the desk, to boot.) Minimalist because, aside from those features, there's only a drawer to distinguish this piece. It's also relatively minimal in size, at 64" wide, 12" deep and 30" high. Unless the #230 comes with a keyboard drawer, I don't think many people will be able to get a computer situated usefully on this desk. Twelve inches doesn't seem like enough room (or Rhoom) to get a keyboard and a display on. But it still makes an awesome writing desk. I think the Rhoom Web site is a little too minimal, because I can't find pricing on it. There is contact info, though, so you can get in touch with them if you're interested. I'm curious what the little cabinet would be good for. CDs? One thing about that, it makes the desk "right handed," because that little cabinet would always interfere with a lefty--writing, mousing, whatever. 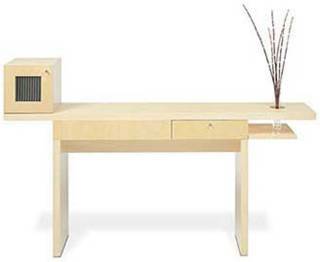 can't figure it out but every time i look at this desk i want to say " here doggy "